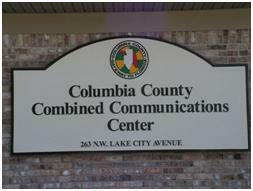 The Columbia County, Combined Emergency Communications Center is the primary Public Safety Answering point (PSAP) for all of Columbia County, Florida. A secondary or back-up PSAP is located off site. The Center provides centralized dispatch services for Columbia County and Lake City Fire Departments, EMS resources and law enforcement dispatch for the Columbia County Sheriff's Office as a part of the Columbia County First Response System. The Emergency Communications Center is located in the Combined Communications Center complex located at 263 NW Lake City Avenue in Lake City, Florida. 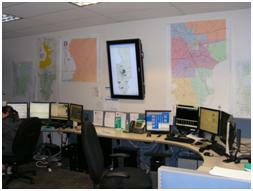 The Center operates a computer aided dispatch system that identifies and recommends for dispatch the nearest appropriate unit to an emergency. In addition the system provides GPS (Global positioning System) tracking for emergency vehicles allowing Operators to actually see the location and dispatch the closest appropriate emergency equipment to a scene. All Operators working in the Emergency Communications Center are certified through the Florida Department of Health as 9-1-1 Public Safety Telecommunicators. "911 what is the address of your emergency?" Locations of the emergency (Street address and nearest cross street). Additional questions may be asked depending on the type of emergency. Important: If you're not sure whether the situation is a true emergency, officials recommend calling 911 and letting the call-taker determine whether you need emergency help. Be prepared to follow any instructions the call-taker gives you. Many 911 centers can tell you exactly what to do to help in an emergency until help arrives, such as providing step-by-step instructions to aid someone who is choking or needs first aid or CPR. If you dial 911 by mistake, or if a child in your home dials 911 when no emergency exists, do not hang up-that could make 911 officials think that an emergency exists, and possibly send responders to your location. Instead, simply explain to the call-taker what happened.